Need Document Attestation for UAE,Qatar,Oman, Kuwait or Saudi Arabia? We assist with Attestation of all South African certificates and documents. 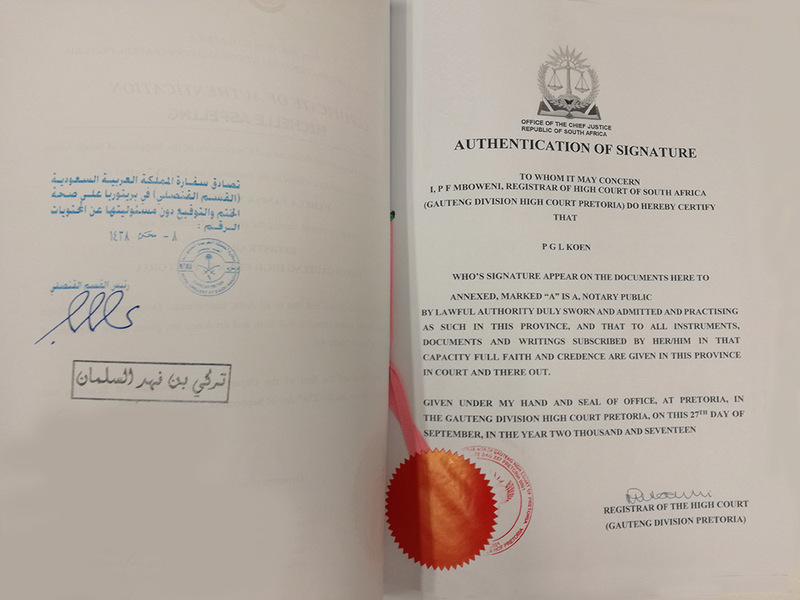 Legalisation (or ATTESTATION as it is commonly known) is the process of authenticating and stamping a South African document to the required level so that the Middle Eastern countries such as the UAE, Qatar, Saudi Arabia, Kuwait and Oman will be happy to accept it as genuine. Attestation is most commonly used to authenticate academic, marriage or legal documents for employment or higher education purposes abroad. Our processing time for attestation is largely dependent on which embassy you require stamping from and your documentation. Currently, the Saudi Arabian embassy has the longest processing time – just less than 2 weeks. Whereas the UAE embassy will have documents stamped within 3-5 working days. We have offices in Pretoria and have access to all Embassies and Government departments in South Africa's Capital City. We help and accept documents from individuals and companies from South Africa as well as those that are abroad with their various document requirements by providing a quick and 100% genuine attestation/apostille service. Apostille (also known as notarial and authentication) is the term given to the authentication of the seals and signatures of officials on public documents. In order to be valid for international use, birth certificates, notarials, court orders and any other document issued by public authority must be apostilled. When will you need an apostille? Apostilles are needed when requiring stamped documents for use in countries that are parties to the Hague Apostille Convention. Any country not appearing on this list is not a signatory and as such documents cannot be apostilled for that country and will instead have to be authenticated / attested. What is the general procedure for stamping documents? Understanding the requirements of the country you wish to travel to. Do you require apostille or attestation? Documents needing to be attested will be sent directly to the Embassy of the country you wish to travel to. Middle Eastern embassies provide stamps and authentication that are higher than the Notary Public, High Court, Department of Basic & Higher Education, HPCSA and DIRCO. Documents needing apostille will be sent to the relative offices for stamping/authentication. This will add to your processing timeline. What is the processing timeline for stamping documents? The processing timeline is solely dependent on which Embassy you require stamping from and the documents in question. Which documents must I send for attestation to proceed? You may attest any original educational qualification, unabridged birth, marriage and death certificates. Where can these documents be legalised and attested? The majority of documents that are required to be attested can only be attested in Pretoria as this is where DIRCO (The Department of International Relations and Cooperation a.k.a Foreign Affairs) is located. Should I apostille my documents or authenticate instead? An Apostille is a form of authentication issued for documents that will be used in countries that participate in the Hague Convention. Authentications refer to countries that are not members of the Apostille Convention and require different forms and certifications. The process is similar to obtaining an apostille; however it requires the additional Embassy Legalization by the Embassy of the country in which the document is to be presented. Why trust Visa Logistics with your important documents? Here at Visa Logistics, we have formed strong bonds with the Gulf region embassies in South Africa. We specialise in facilitating documents within the UAE, Qatar, Saudi Arabia and Kuwaiti embassies. In our years of dealing with these particular embassies, we have grown to understand their requirements and regulations. We pride ourselves in producing services in the fastest time possible. We understand the deadlines of life and the strenuous admin that comes with it. That’s why we offer full services of collecting your documents, facilitating and delivering back to your doorstep.